The change in direction near the end is messing up all of my cuts. I’m not sure why, but it’s like the cutter is all of a sudden on a different path and is chattering against the side of the stock. Is this the climb vs. non-climb in terms of cutting direction? In any case - I’m wondering if I can post the GCode here, and someone can help me figure out how I can manually fix it. Or, is there something I can look for in terms of the cutter changing direction in the code, and then go in and fix it? If your Z0 is top of stock this is an awfully deep plunge. A good rule of thumb is no more than 1/2 the diameter of the tool (end mill). This much, especially with an 1/8" end mill, is going to cause of chatter. The cut vs. plunge rates looks good (40 vs. 9) - 4 to 1 is a good rule of thumb for the ratio (until you know more about the tool and material). Climb vs. conventional cutting can cause chatter but at the speeds you’re moving at I would expect the difference to affect the finish more than anything. Since the G code is generated by a program, there isn’t too much we can do without being familiar with the software. Recalculating direction requires chasing virtually all of the G code - doable but a lot of manual math and editing. The G code looks… inefficient. That’s due to the way the software works. Circle cutting should use G02/G03. This would be MUCH smaller if it did. Here is the visualization. It does exactly what you describe (you’re not crazy). This is crazy inefficient G code generation. The full retracts are often a setting in the software. The post processor should allow for G02/G03 (circles). They changed the software for the worse… sorry. Maybe someone who knows the package can advise? Can’t recall where those percentages came from though — if anyone knows of a reputable reference w/ those numbers I’d be glad of them. The code I posted is not the first cut - it’s right near the end of the cut. I was using a .03" depth per cut and a 40ipm feedrate. If you’ve used Easel on your machine, check the settings for Grbl — Easel has been known to re-write the settings, esp. the $102 # of steps for the Z-axis to match the settings suited to the Shapeoko 2 and similar machines w/ a threaded rod for the Z-axis. I trained as physicist. There was/is never a budget or availability for the parts one needs (you want an inlet port for a Nitrogen laser???). We had to make things ourselves. Which meant we had to learn how. I was first taught machining by machinists of the Manhattan Project era (near the end of their careers). They were an amazing bunch… I miss them. They were very concerned about safety (try machining precision molds for explosives; plutonium), fine finish (try machining…), correctness (we have to get this done quickly and correctly, there is a war on), and low waste (there is a war on). We learned/worked on hand driven knee mills (Bridgeport, a company still in business). Learn to do it manually, then add automation (which was governor driven motors). Things were handed down orally, student to teacher, so I do not know of a written reference. I will dig our my Machinery and see what I can find something this weekend. As a machining and CNC teacher myself I still pass along what they taught me, albeit updated for the CNC age. In there honor, I pass along what I was taught. A) Never, never, never put any part of your body inside the work volume when the spindle is engaged. The end mill can cut through steel. Your hand is softer. A mistake only takes an instant. When manually milling, always keep your weak hand behind your back (grasp your belt). Always wear short sleeve shirts or turn up your sleeves and use a band to keep them that way. Nothing that might catch on the machine. B) A drill is 4 times better at plunging than cutting. An end mill is 4 times better cutting than plunging. C) Do not cut material deeper than 1/2 the diameter of your end mill. D) Plunge an end mill at 1/4 the cutting feed rate. E) Learn to HEAR and FEEL chatter. instantly. What’s known a unconscious competence. E) When dealing with a new material and/or tool, perform tests. Look up the chip rate (per flute) from the material vendor. Calculate the feed and speed. Start with the general guidelines above - even if the end mill vendor says differently. F) Never, never, never trust a feeds and speeds formula from an outside source - test it carefully. Spindle power, lubrication, axis drive motor power, and end mill sharpness can be different. different in hardness and density than oak from Illinois… or Spain. TEST IT CAREFULLY! your determine from your initial tests. Use downtime to optimize. the finish is. Finish is not only about looking good, it can be a critical requirement in some usages. I) Use the correct tool for the job. If you don’t know, ASK! (Mark) Do not go for cheap end mills from unknown sources. They are crap. Speed Steel (HSS) and cut faster! and since it is optimized for the job will give you amazing cut speeds and fine finishes. (Mark) My “go to” tool vendors are Niagra and Onsrud. My “go to” coating is AlTiN. YMMV. (Mark) Carbide3D has very good end mills. I don’t buy them because I have $$$ of tools already. considerably more than the increase in cost - and they allow machining to go faster too. select/order them, and to not get lost in the coatings forrest. how to use jigs and fixtures to make the work flow be efficient. see why they could see how this was necessary, instantly, from the outset. Well worth the effort! (Mark) Safety should be the first priority. broken end mill or a poorly fixtured part can go flying at high speeds. An enclosure should be a very high priority item. If not, eye protection is a must. Spindles moving at high speed and running at high revolution rates create a lot of noise. Yes, mowing the lawn is dangerous to your hearing. small machine. I can help if anyone wants to know. are as or more dangerous than Asbestos. hard generate some nasty vapors. An enclosure should be a very high priority item. You've got a CNC machine - make one! ahead of the dust collector. It will increase the life of your expensive HEPA filters dramatically. plastic cyclone (e.g. see Oneida). Remember to empty the cyclone and "shop vac" OUTSIDE. masks at a good price). I use a waterline cutting path to do my 2d shapes out of MeshCAM. @ApolloCrowe Is there a way I can copy and paste images in MeshCam? I nest 5 - 6 wooden shapes per 8" x 8" board and haven’t seen a way to add shapes and move things around in mesh cam. There is no way to do multiples in meshcam. How are you preparing your artwork? Can you duplicate in inskape or illustrator, then open it in meshCAM? Yes - I can give that a try in illustrator. I guess it just makes it easier if I can move things around in the CAD as opposed to just using an image. But let me give it a try and we’ll see!! 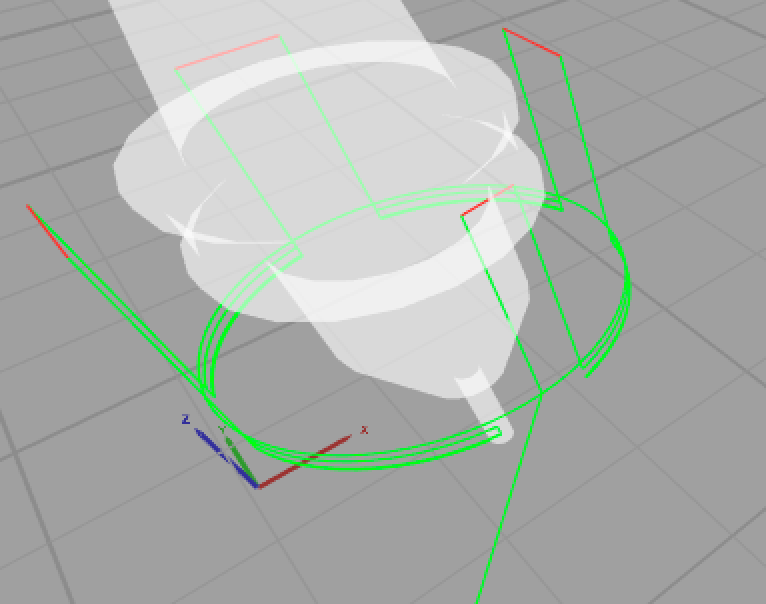 @ApolloCrowe what do you set the surface angle at to cut out a 2d shape when using waterline? Darren, What CAD do use? For a 2D waterline tool path I don’t think it applies. I was using Easel as my CAD - so basically I have no cad experience. But I have Vetric cut2d now which is dead simple to use like easel, but gives me a lot more control over every detail. I hope to have something available in a few days. I posted the Vectric post processors.